IBM DB2® for z/OS® is a high-performance database management system (DBMS) with a strong reputation in traditional high-volume transaction workloads that are based on relational technology. IBM WebSphere® Application Server is web application server software that runs on most platforms with a web server and is used to deploy, integrate, execute, and manage Java Platform, Enterprise Edition applications. In this IBM® Redbooks® publication, we describe the application architecture evolution focusing on the value of having DB2 for z/OS as the data server and IBM z/OS® as the platform for traditional and for modern applications. 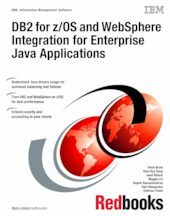 This book provides background technical information about DB2 and WebSphere features and demonstrates their applicability presenting a scenario about configuring WebSphere Version 8.5 on z/OS and type 2 and type 4 connectivity (including the XA transaction support) for accessing a DB2 for z/OS database server taking into account high-availability requirements. We also provide considerations about developing applications, monitoring performance, and documenting issues. DB2 database administrators, WebSphere specialists, and Java application developers will appreciate the holistic approach of this document.